Juventus came into this game with the opportunity to move within 3 points of Champions League qualification. Chievo, on the other hand, just needed one point to ensure that they remain in the Serie A next season. The pre-match graphic illustrating how the teams were supposed to line up is what motivated me to write this article. 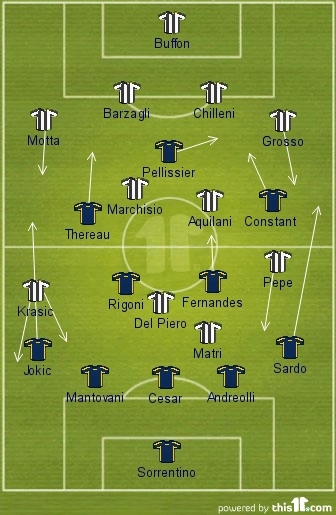 The Bianconeri was shown to be lining up in a 4-4-2 with the Flying Donkeys, in a 5-3-2. The variety of formations and tactics in Serie A is what I love most about this league. How the really lined up? Juve’s ‘4-4-2’ featured 2 deep lying passing midfielders and sometimes resembled a 4-2-2-2 with the wingers tucking in on occasions. Chievo’s set up differed a bit to that which was expected by the broadcasters as attacking midfielder Constant played much further up the pitch than his defensive minded colleagues. In the attacking phase it would be fair to say that the team from Verona’s formation was more of a 5-2-3 with the wing back get forward whenever possible. The game started with Chievo’s attackers trying to prevent Juventus from building their attack from the back. The front 2 along with Constant pressed the back line while Fernandes and Rigoni did a very good job closing down both Aquilani and Marchisio whenever they dropped deep to help link the defense with the attack. Sardo and Jokic kept a watchful eye on Pepe and Krasic forcing them to pass backwards whenever in contact with the ball. Juventus were forced to play long passes into their forwards as Chievo pressed relentlessly. Chievo were doing very well at this point but when they themselves were in possession they were wasteful and gave the ball away cheaply. Their attacking strategy seemed to be to get the ball forward to their attackers as quickly as possible, hold it up and wait for their wing-backs to get forward to provide width. When Juventus was able to get the ball forward they looked to exploit the flanks as Del Piero and Matri were marked very closely and tracked all over by their man markers. The 3v2 advantage Chievo had in this area meant that they could afford for one defender to track the roaming forward while his other two colleagues dealt with the one who stayed centrally. It was vital that both Aquilani and Marchisio switched the ball to the flanks as quickly as possible to capitalize on a potential 1v1 situation on the wings. This 1v1 was sometimes a 2v1 as Motta and Grosso got forward unopposed, as can be seen from 0:47 to 0:50 in the video below. 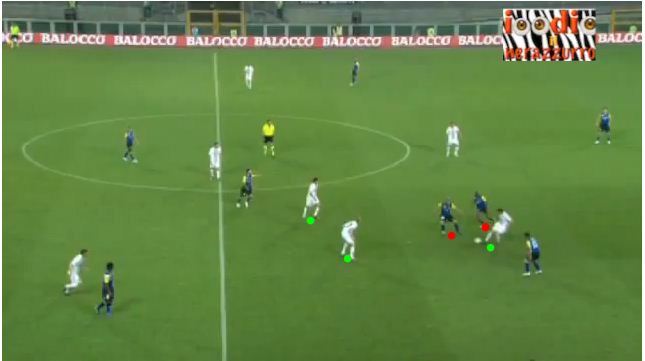 This showed up a shortcomings in Chievo’s tactics. The roles players are given in a formation have more to do with how the game is actually played than the formation in its numerical form. The instructions given to Chievo’s front 3, apparently, was to not drop too deep in the defensive phase which meant when the ball was in the final third the defending was left to their 5 man backline and the 2 defensive midfielders. This caused the 1v1 situation on the flanks as either midfielder was reluctant to go out to the flanks to assist their wing-backs because this would leave a 2v1 advantage in the centre of the park. Motta and Grosso caused further confusion when they got forward as it seemed that no one was assigned to track their runs. A simple tweak in the instructions given to those furthest forward could have help solve this problem. A front 3 deployed similar to that of Mourinho’s 2009/10 Internazionale, with the 2 wide forwards tracking the runs of the fullbacks, would have put a different spin on Chievo’s 5-2-3 albeit making it a lot more defensive. Juventus took the lead from a 13th minutre Alessandro Del Piero penalty which was given when Pepe was obstructed while trying to get on the end of a Motta cross. Motta also set up Aquilani brilliantly with a cut back in the area which the ex-Roma star squandered. Almost all Juve’s came on the flanks most likely for reasons previously explained. It was quite baffling that Juventus were not able to control this game with the talent which the have. Chievo are obviously a poor team but on the night they were doing well defensively. Maybe a slight change in the formation usually used by Del Neri may have helped Juve on the night. With a 4-5-1 they would have had an overload in the midfield giving them a better chance to control that area. Juventus were clearly losing the battle with Chievo central pairing. For this reason I believe that Krasic and mainly Pepe drifted inside to create an overload but having an actual third centre midfielder would have best benefitted the Bianconeri. This would have forced Stefano Pioli to adapt his formation by putting an extra body in the midfield thus switching to a 4-3-3 or a 5-3-2. The former would be the more likely of the two as one central defender becomes redundant when a 5 man defense plays against a lone striker. The second half started brightly for the home team as they were able to create a momentarily 3v2 overload in the midfield with an unmarked Del Piero coming deep for the ball and Krasic tucked in combining with Aquilani to pass the ball around Fernandez and Rigoni who were too close together and square. Del Piero was then allowed to play a through ball to striking partner Matri who coolly extended the lead. The 23-year old Colombian repaid his coaches faith in him as he got Chievo back within a goal 4 minutes into his debut. His energy, enthusiasm and tactical discipline gave the Veronesi a much needed lift. He played in the left attacking midfield position vacated by Constant but he offered more defensively than the man he replaced. He dropped into the midfield to help out in the defensive phase and played some useful outlet passes to initiate attacks. Chievo eventually equalized and the comeback had large part to do with Uribe. His star faded a bit though when he missed the perfect opportunity to put his team in front bottling a one on one with himself and a defender on the line. The game was stretched at this point with a lot of space given to those in the middle, Juve’s fullbacks were pushed forward and Chievo tried to capitalize on the counter attack. Juventus had great opportunities to score a third but were twice denied by the upright and Krasic narrowly missed an open header from about 6 yards out. All those opportunities except one came from crosses two of which were from open play. Late on Krasic was substituted for Luca Toni to try and give the Bianconeri a better chance to score from their main source of attack, crosses from the flanks. Juventus would only have themselves to blame for not getting full points from this encounter. Their inability to control the game proved to be their undoing even at 2-0 down Chievo didn’t seem out of it. Marchisio and Aqualiani were very quiet as of the middle of the 1st half and were never allowed to dictate the tempo of the game. At times in the 2nd half the midfield was overlooked and long hopeless balls were played forward. Shocking for a team of Juventus’ stature playing against a struggling Chievo, who deserved the point which ensured that they would be playing amongst Italy’s best next season.